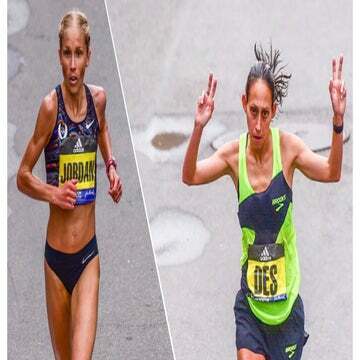 Her time was the fastest American marathon debut at the Boston Marathon ever. 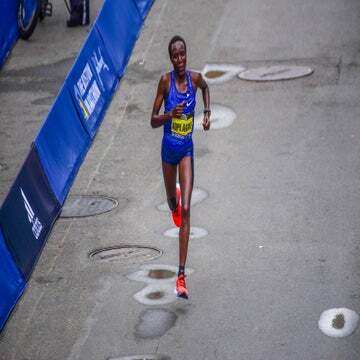 Kenya’s Edna Kiplagat, in her Boston Marathon debut, took the win in 2 hours, 21 minutes, 52 seconds. Jordan Hasay, in her marathon debut, finished third and first American in 2:23:00, with the fastest U.S. debut ever. Des Linden took fourth in 2:25:06. However, Hasay proved from the gun that she had a fight to put up—and she had reason to run the race of her life. Her mother passed away last November, someone she called her number-one fan, as well as the woman who got her into running. “She’ll be with me. In her handwriting, it says, ‘Boston, be my shining star.’ That’s what I tell myself. Shining star,” Hasay said earlier at the pre-race press conference. Des Linden led miles 5 through 12, bookending the infamous Wellesley scream tunnel, executing her race plan flawlessly as usual and paying no mind to the nine other women chasing her heels down. She looked relaxed through the first half of the race—well, Linden usually looks relaxed no matter what. “I wanted to be patient the first 10K or so and just feel it out, if it was respectable pace. There’s so many fast half runners in there, I can’t let it be too slow, they would destroy me. After the 10K I knew I had to put the foot on the gas just a little bit,” Linden said of the early push of the pace. As temperatures climbed into the 70s, runners started to keep cooler through aid stations by grabbing water cups and, as announcers said, “taking a bath” in the water. Still, the heat didn’t seem to affect Linden, Hasay, or the other five African women chasing them through the half marathon mark. The pace during the first half of the race started to suggest Hasay’s debut would be the best American debut in history; it ended up being just that, by more than 3 minutes. By the 30K mark, Hasay had runner fans buzzing even more with her comfortable demeanor sitting with a three-pack, chasing Kiplagat’s insane move up the hills. People had good feelings about her cross-country background and track legs carrying her far in the final 10K. 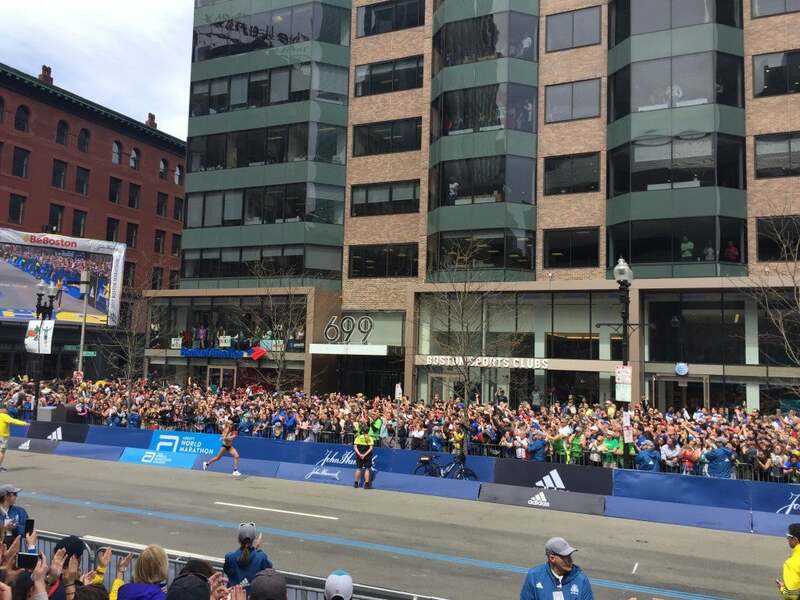 As Linden yo-yoed between falling off the group and catching back up, attention increased on Hasay, who was looking to have a very strong stride down Boylston Street. Could she break the drought? Kiplagat’s aggressive hammer to a massive lead was convincing and powerful enough to get her the win by 59 seconds. Hasay was outwardly emotional crossing the line in third, remembering her number-one fan, her late mother, that she honored by wearing her engagement ring during the race. 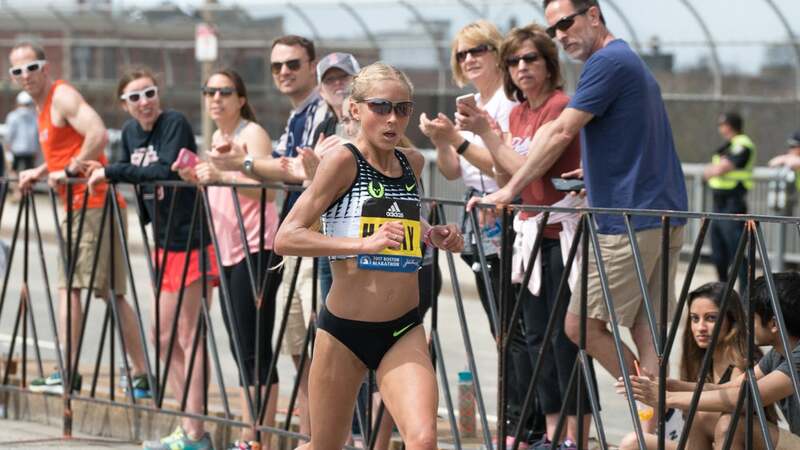 “I think the marathon is a very emotional event, and I try to stay as relaxed and calm as possible and just breathe early on,” Hasay said of emotionally getting through the race. “The crowds were loud at the end, chanting, ‘USA! USA!’ I tried to feed off that energy. Hasay and Linden’s strong third and fourth place finishes were the highest net finish by two Americans since 1991. It was reminiscent of Linden’s Olympic performance with Flanagan and Amy Cragg, where the trio had the strongest American Olympic performance ever. On the men’s side, all cheers were for Galen Rupp, who finished second in his Boston debut, and all emotions were for Meb, who ran his final Boston Marathon and, in true Meb fashion, expressing massive gratitude for the crowds and support from Hopkinton to Boston.